What It Is: A new line-up of springy shoes from 138-year-old brand Liberty, available exclusively at The Bay by way of the brand’s UK headquarters. What’s cool about Liberty is they don’t just design for themselves – major fashion houses like Marc Jacobs have pilfered their prints for their own looks thanks to Liberty’s classic-yet-cheerful take on the ubiquitous floral pattern, which at this point is pretty much perennially trendy each and every Spring. The new line-up of ballet flats, wedges, sneaker wedges, and slip-ons will put you in step with the season – and style. Who It’s For: A pair of sneaker wedges for your fashion maven little sister, so she can stand out now and maybe possibly cringe at the style later. A pair of ballet flats for each of your bridesmaids, to wear during the reception but still look festively sweet. A set of bow-topped espadrilles for your mom for Mother’s Day, to don for her annual garden parties. What It Costs: The ‘Toms-inspired’ slip-ons start at $69, with prices creeping up to the $129 mark for the sneaker wedges. My personal favourite, the classic flats, are $79. Where It’s At: As I mentioned, The Bay is the exclusive source in Canada for Liberty’s lineup of floral printed blouses and pretty shoes. 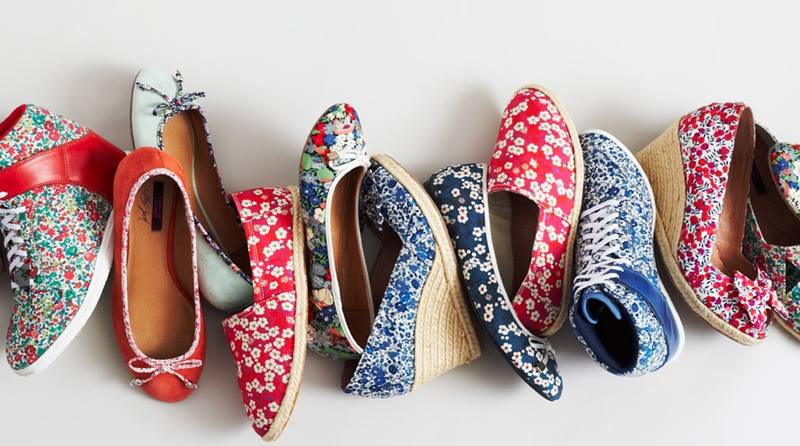 Ezensa bonus entry: tell me which pair of Liberty spring shoes you’d most like to wear (or gift)! The red Liberty Art Khorixas as my choice. I love the LIBERTY ART FROHBL, FLORAL PRINT FLAT BALLERINA WITH BOW. Super cute for myself or my daughters! Unfortunately the Bay does not seem to carry the fabulous wedges from your post photo – those would be my choice. I am not much of a ballet flat girl. Hey Beatrice! I actually saw them in-stores this past weekend – don’t despair. Online I don’t believe they carry the full line-up, but get down to your local HBC and you may luck into a pair. I’d like a pair of the Liberty Art Pase in blue/white. I love the Liberty Art Frohbl in navy print. Liberty Art Frohbl in the multi coloured floral print.They would sure liven up a wardrobe. The LIBERTY ART KHORIXAS in Mint. I would try wearing the LIBERTY ART TROMBLY! Ezensa bonus entry: the pair of Liberty spring shoes I’d most like to wear is their, “Liberty Art FROHBL” floral print flat ballerina with bow, in their navy print. Thank you. Oh I love all of those floral patterns!! But those prices is scaring me off 😦 boo!